10 Using King's Pardons (KP's): explanation by brave Captain with the scurvy name "GUT"
The Presidios are fortresses left by the Spanish across the Caribbean during their conquest of the New World. Your ability to capture, hold, and develop the Presidios will determine your Brotherhood's standing and dominion over the Spanish Main. No Captain can do it alone - to join the fight you must ally with an existing Brotherhood, or start your own. The Dominion Map is a new scale displaying Brotherhood Dominions according to the amount of territorial waters they control from their Presidios. To view the Dominion Map, go to the Map and select one of the scale buttons in the upper right corner of the screen (just below the "Haven" button). Presidios can be found scattered across the Spanish Main. They may be heavily defended by Spanish garrisons or rival Brotherhoods - so plan your attack wisely. Upgrading your Presidio increases the area it controls; raises its Defensive Bonus against attacks; increases the efficiency at which it earns King's Pardons and the number it can issue; and broadens the range of Unit types it can Pardon. Fortunately for you, the British Crown has made a secret offer to any Gentleman of Fortune willing to fight the Spaniard - Letters of Marque offering the King's Pardon as a reward for every Spanish sailor defeated in the battle over the Presidios. Units who receive the King's Pardon are forgiven all past crimes, boast higher defensive and offensive statistics, and cost far less to maintain than regular forces. Go to the Brethren Court and open the 'Presidios' tab to manage your Brotherhood's captured Presidios. You can get updates about your Brotherhood's Presidios from your Master at Arms' reports. The Merchant will inform you about Resource deliveries to your Presidios. You can find more info on Presidios in the Help Window. The Presidios are fortresses left by the Spanish across the Caribbean during their conquest of the New World. They represent powerful strongholds from which your Brotherhood can project your dominion over the sea lanes, fight off the Spanish Armada, and rise above rival Brotherhoods. Your ability to capture, hold, and develop the Presidios will determine your Brotherhood's standing and dominion over the Spanish Main. As your Brotherhood captures and develops Presidios, your control over the Caribbean will be shown on the Dominion Map. It won't be easy. The Spaniards won't give up the Presidios without a fight, and developing them will take teamwork and discipline. No one Captain can do it alone - to join the fight you must ally with an existing Brotherhood, or start your own. Presidios can be found scattered across the Spanish Main. They may be heavily defended by Spanish garrisons or rival Brotherhoods - so plan your attack wisely. Any Brotherhood that captures a Presidio will have to defend it from increasingly powerful attacks by the Spanish Armada. While this may sound like a poor proposition for any self-respecting pirate, there's a silver lining: The British Crown has made a secret offer to any Gentleman of Fortune willing to fight the Spaniard - Letters of Marque offering the King's Pardon as a reward for every Spanish sailor defeated in the battle over the Presidios. Units who receive the King's Pardon are forgiven all past crimes, boast higher defensive and offensive statistics, and cost far less to maintain than normal forces. Upgrading your Presidio increases the area it controls; raises it's Defensive Bonus against attacks; increases the efficiency at which it earns King's Pardons and the number it can issue; and broadens the range of Unit types it can Pardon. A Presidio's Dominion Range (the amount of surrounding territory it controls) is determined by its level of development and its proximity to adjacent Presidios controlled by the same Brotherhood. This means that two Presidios of identical development levels can have different Dominion Ranges. If a Presidio is positioned adjacent to one or more Presidios owned by the same Brotherhood, it receives a boost to its Dominion Range - so try and capture as many adjoining Presidios as possible. The total territory of all Presidios controlled by your Brotherhood will be the sole factor determining your Brotherhood's position in the Brotherhood Fame Rankings and influence on the Dominion Map. Once a Brotherhood has captured a Presidio, its Members must pool their Resources towards developing it. Every Brotherhood Member can contribute Resources towards the Presidio's next upgrade level. The progress bar will display the Brotherhood's collected contribution in demarcations from 20,000 to 50,000 Resources of any type. Once the progress bar is full, the Presidio will upgrade to the next level and its Dominion Range and Defensive Bonus will increase. If a Brotherhood's Presidio is captured, it automatically loses 1 Level after the first 60 minutes. This means you can capture it back without further damage if your Brotherhood moves quickly. 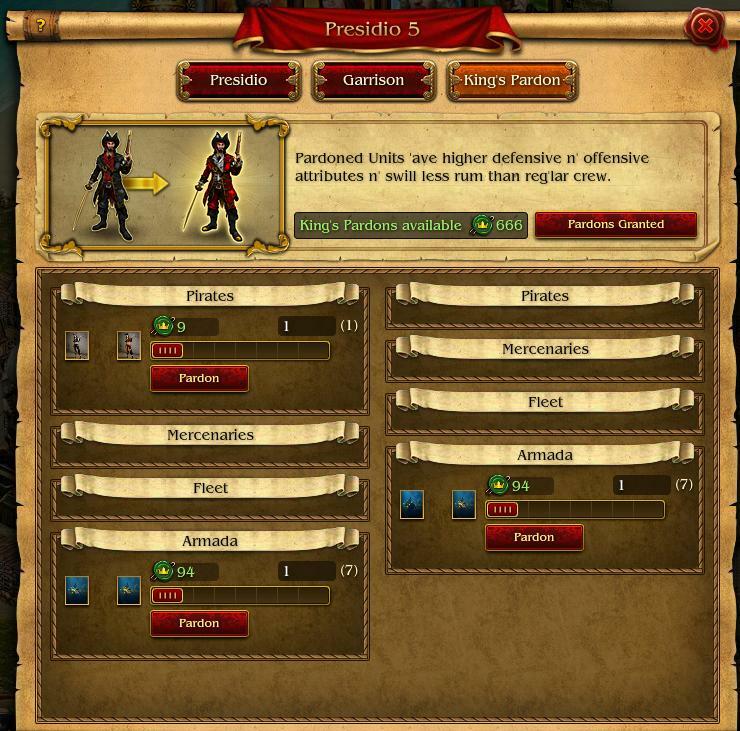 Go to the Brethren Court and open the "Presidios" tab to manage captured Presidios. You can get updates about your Brotherhood's Presidios from your Master at Arms' reports. The Merchant will inform you about Resource deliveries to your Presidios. The Dominion Map is a new scale displaying Brotherhood Dominions according to the amount territorial waters they control from their Presidios. To view the Dominion Map, go to the Map and select one of the scale buttons in the upper right corner of the screen (just the below the "Haven" button). Brotherhood Leaders or Advisors can designate the combatant status of other Brotherhoods from the "Brotherhoods" tab at the Brethren Court. Find the Brotherhood you wish to designate from the Brotherhood list, then mark them as either Neutral, Enemy, or Allied. Once you've changed a Brotherhood's status, it will be reflected on the Dominion Map with the appropriate icon for all of your Brotherhood's Members. Captured Presidios will appear on the Map with the occupying Brotherhood's Flag. "Pardons" where you can: - Select the number and type of Units to be Pardoned. Click "Pardon" to grant it to them. - Review the Presidio's King's Pardon History "Send Reinforcements" - Select this option to send reinforcements to a Presidio. This option is only available for Presidios currently occupied by your Brotherhood. "Capture" - Send a force to capture a Presidio. "Scout" - Attempt to Scout a Presidio. "Go to the Brethren Court" - Opens the Brethren Court window and allows you to view the stats of any Presidios your Brotherhood currently controls by clicking the "Presidios" tab. You may also to send reinforcements to a desired Presidio from this window. Use the Navigation Panel or Mouse Scroll from the Dominion or Regular Map to view a Presidio's pop-up action menu. If a Presidio is captured by a rival Brotherhood, all surviving Crew guarding the Presidio will be returned to their Home Havens. To control a Presidio from the Brethren Court, your Brotherhood must have captured at least one Presidio on the map. Once you have control of one or more Presidios, go to the Brethren Court and open the «Presidio» tab. From here you can view information on the number and type of Units currently Garrisoned at any Presidio occupied by your Brotherhood. Advisers and Commodores can also use this interface to transfer Royal Pardons between their Presidios. Click on the Brethren Court's icon to view the Presidio on the Dominion Map. Click the button in the right-hand part on the screen to open the Presidio's Stats Window. From here you can contribute Resources. The Presidio control window is available at the Brethren Court only if you have already joined an existing Brotherhood, or created your own. You will receive battle reports on your Brotherhood's Presidios from your Master at Arms' reports. Your Merchant will keep you informed on Resource deliveries between your Haven and your Brotherhood's Presidios. To control Reinforcements garrisoned at your Brotherhood's Presidios, open the «Garrisons» tab. From here you can view, reinforce, or recall any Reinforcements you have stationed at Presidios captured by your Brotherhood. Controlling and developing the Presidios is a task of such enormous scale that it can only be attempted by a highly-organized Brotherhood of Captains. You must join an existing Brotherhood or create your own if you want to join in the fight. Presidios can be found scattered across the Dominion Map. Take and hold the Presidios - the sum of their controlled territory will be the sole factor determining your Brotherhood's position in the Brotherhood Fame Rankings and influence over the Dominion Map. Presidios may be heavily defended by Spanish forces or rival Brotherhoods, so attempting a successful attack will require careful planning and execution. Developing a Presidio increases its Defensive Bonus and its Dominion Range (the amount of surrounding sea it controls). Once a Brotherhood has captured a Presidio, its Members must pool their resources towards its development. Every Brotherhood Member can contribute resources towards the Presidio's next upgrade level. Go to the Brethren Court and open the 'Presidios' tab to manage your Brotherhood's captured Presidios. You can get updates about your Brotherhood's Presidios from your Master at Arms' reports. The Merchant will inform you about Resource deliveries to your Presidios. 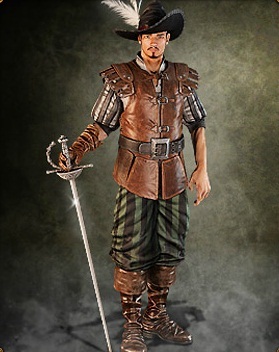 These master swordsmen are the disinherited sons of once-noble Spanish families currently out of favor with the Crown. Penniless and desperate - they truly have nothing left to lose. The King has offered to restore their family lands and titles in exchange for the service of their blades. Ruthless, merciless, and brutal - the infamous Conquistadors have been recalled from their bloody work grinding the native populations of the New World under their heel to aid the King's Fleet in eradicating the Pirate threat once and for all. 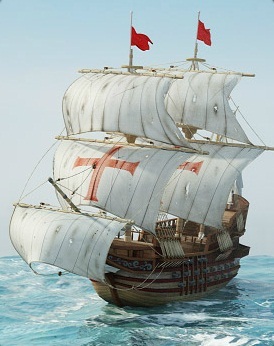 Los Infiernos are specially modified naval galleons of the Spanish fleet. 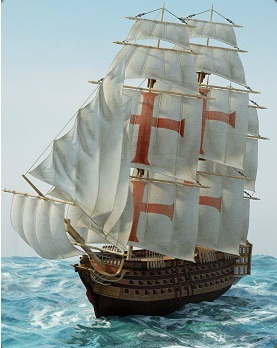 Commissioned by Pedro de Alvarado himself, these ships were specifically designed for Caribbean conquest. 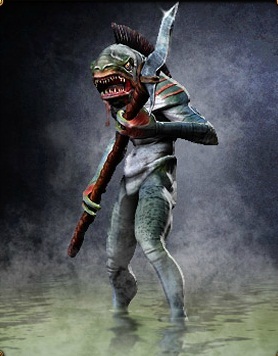 With their ample deck-space for skirmishing and skilled crews, a wise Captain would do well not to underestimate them. Truly, ‘tis a sign of the depth of King Carlos' rage and madness that he has struck a bargain with the old powers of the deep (with offerings of cold silver or tender Pirate flesh), and summoned the dreaded Poseídos to exact his bloody vengeance upon the Pirate Brotherhoods. Keep your eyes upon the water. Be it made known that His most illustrious Majesty, King Carlos-Ferdinand IV of Spain, Emperor of New Spain, Haiti, Hispaniola, etc. has sworn upon his crown to restore his rightful claim to these Presidios, islands, and mainland of the ocean and contents hereof. He furthermore pledges to extinguish the blemish of Piracy, banditry, and all vile practitioners thereof from the face of this Earth and offers no quarter, amnesty, or refuge to those who oppose the invincible vengeance of His Fleets. Kneel down before the Dominion and greater glory of Spain! After years of losses to his Treasure Fleets, the brutal Spanish King Carlos-Ferdinand IV has vowed to end the Age of Piracy by recapturing every Presidio in the Caribbean. These mighty sea fortresses were scattered across the seas by the Spanish during their conquest of the New World. They allow their captors to either project their dominion over the surrounding sea lanes, or defend the Pirate realm from extermination! The good news - it seems the British hate the Spanish even more than they despise us! The British Crown has issued Letters of Marquee offering full Royal Pardons for every Spaniard your men cut down. Use them to Pardon your Regular or Veteran Units, and in addition to becoming more fearsome fighters, they'll consume much less Rum than your normal crew. (Not living in daily fear of the hangman's noose does wonders for their morale). The Spanish Crown has vowed to secure its Presidios, preserve its stranglehold over the New World, and regain total control of the Caribbean - if it means hunting down every last Pirate alive. Any Brotherhood that captures a Presidio must be ready to defend it against waves of attacking Spanish forces (not to mention fellow Pirate Brotherhoods). In exchange for undermining the Spanish, the British have set aside their differences with the great pirate Brotherhoods and arranged Letters of Marquee secretly granting them full King's Pardons for each successful defensive victory against the Spanish Armada. These can be used to Pardon your Units - making them cheaper to maintain and giving them higher defensive and offensive statistics then your regular crew. All Pardons earned from defeating Spanish attacks are kept and issued from the Presidio where the battle took place, and can be accessed by any Brotherhood Member who's Crew participated in its defense. Bear in mind that a Presidio will attract more Spanish attacks with each additional upgrade level. This in turn will provide you with more Pardons, with which you may Pardon more Crew. The Brotherhood Leaders can transfer King's Pardons between Presidios as they deem fit, although some King's Pardons will be lost depending on the Presidios' respective levels and distance from each other. Send Crew to one of your Brotherhood's Presidios and open the King's Pardon window. Select the number and type of Units you wish to Pardon, and press 'Pardon'. You can review the Presidio's Pardoning History from the 'Pardons Granted' window in the Presidio interface. Once a Presidio is taken, it must be defended and upgraded. 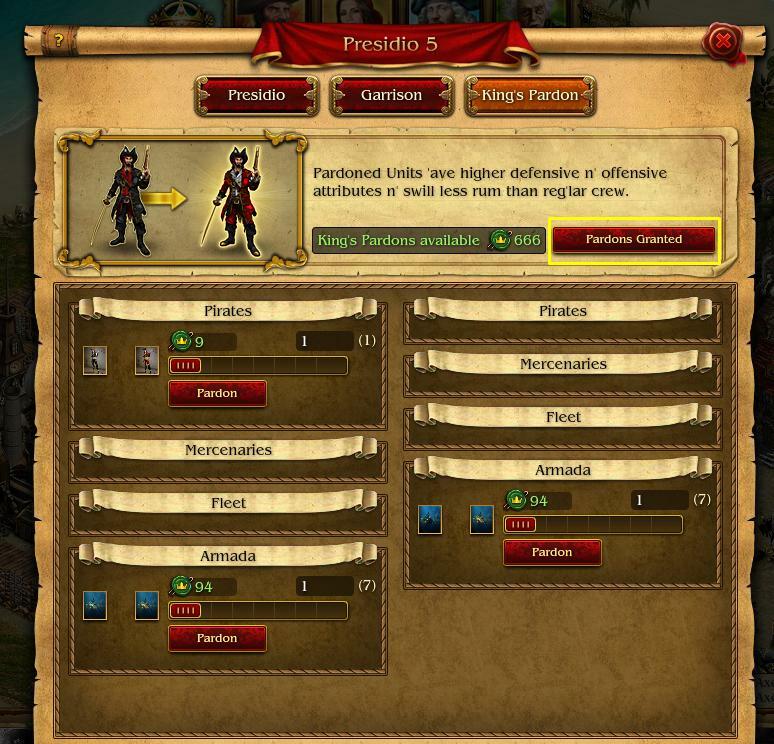 Developing a Presidio increases its Defense Bonus and overall Dominion Range. Given the difficulty, resources, and crew levels required by a Brotherhood to take and hold the Presidios, their total controlled territory will be the sole factor determining your Brotherhood's position in the Brotherhood Fame Rankings and representation on the Dominion Map. 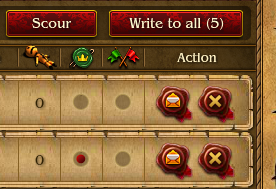 Use the King's Pardons you earn by defeating the Spanish to Pardon your Units. 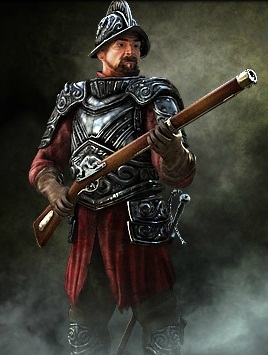 In addition to improved offensive and defensive statistics, units that receive the King's Pardon no longer live in fear of the gallows - and so consume much less Rum than your normal units. This means that you can support a far larger force using Pardoned units than you would normally. All King's Pardons earned by your Brotherhood are kept at the Presidio where the battle took place, and can be accessed by any Brotherhood member whose Crew participating in its defense. Brotherhood Leaders can transfer Pardons between Presidios at their discretion, but your messengers (being pirates, after all) will sell them for cash and rum as they go - so the farther away the receiving Presidio, the higher the percentage of each transfer will be lost. You can Pardon different Unit types depending on a Presidio's development level. Level 2 unlocks Pirates; Level 3 - Mercenaries; Level 4 - Fleet; Level 5 - Armada. A Presidio will attract more Spanish attention with each additional upgrade level. This will in turn allow you to earn more King's Pardons, which you can use to create a larger, cheaper, more powerful force. The key to success is finding the best balance of losses vs. new Pardoned Units given a Brotherhood's spread of Presidios and Brotherhood Members. Controlling and developing the Presidios is a task of such enormous scale that it can only be attempted by a highly-organized Brotherhood of Captains. You must join an existing Brotherhood or create your own if you want to join in the fight. Presidios can be found scattered across the Dominion Map. Take and hold the Presidios - the sum of their controlled territory will be the sole factor determining your Brotherhood's position in the Brotherhood Fame Rankings and influence over the Dominion Map. Presidios may be heavily defended by Spanish forces or rival Brotherhoods, so attempting a successful attack will require careful planning and execution. Developing a Presidio increases its Defensive Bonus and its Dominion Range (the amount of surrounding sea it controls). Once a Brotherhood has captured a Presidio, its Members must pool their resources towards its development. Every Brotherhood Member can contribute resources towards the Presidio's next upgrade level. Go to the Brethren Court and open the 'Presidios' tab to manage your Brotherhood's captured Presidios. You can get updates about your Brotherhood's Presidios from your Master at Arms' reports. The Merchant will inform you about Resource deliveries to your Presidios. Using King's Pardons (KP's): explanation by brave Captain with the scurvy name "GUT"
To use KP's, your Brotherhood (BH) must have captured a Presidio from King Carlos or another BH. At that point, the Presidio will begin to "fill up" with KP's when King Carlos fails to blockade it. When you have a Presidio and it has KP's in it, members of your BH can begin to use KP's given certain conditions. You can't "issue" KP's in the way you think. You can't "send" a certain amount to a BH member's haven for them to store and use. Instead, you must give them the privilege to use them. Going to the Brethren Court and clicking the member's tab, you will see these buttons. The person on the top has their privilege to KP's turned off: they cannot use them even if they tried. The person on the bottom has their privilege turned on. So they can use them if they do so in the correct manner. Note: only the BH leader or Advisors can turn on/off a players privilege by going to that same screen and click the corresponding player's button. So you have a Presidio, it has Pardons in it, a member has their Privilege turned on: what next? The player must have their units at the Presidio that they want to pardon. Once the units are at the Presidio, they go to the Brethren Court and click the Presidios tab. Once there, they will want to click the red-background icon that I boxed in with yellow. Once there, they will want to click the tab in the Top Right labeled King's Pardon, and they will arrive at a screen like this. They will then move the sliders to the right, click "Pardon", and pardon the selected units. You can't "issue" KP's; you can only allow your BH members to use them, and trust that they only use their appropriate amount. For example, if a Presidio has three-thousand KP's in it, and three people expect to be able to use some, any member with their Privledge turned on can use all three-thousand KP's leaving none for their other BH members. Sounds troubling, challenging, yeah? Because it is. You can't "issue" KP's like you think, instead you have to "manage" your members to use their appropriate amount. This can be done by going to this page, and clicking Pardon's Granted button to see who used how many KP's, and potentially taking away the Privledge of members who use too many. We at NSF had this challenge a long while ago, and put in a program of education and monitoring that works for us. You will have to find that program for yourselves that works at your BH. However, while we were having our growing pains, I made this this slideshow that was pretty helpful to us when we were first getting started. This page was last modified on 27 May 2015, at 14:24. This page has been accessed 25,246 times.